The key attribute of being an animal is ingestion. Of all the life processes (excretion, respiration, etc. ), obtaining nutrients is the only one that requires a specific type of activity. Capturing food for eating—at least for larger, more complex animals—requires thought, responses to environmental stimuli, and specific behaviors and techniques. As will be discovered, the taxonomy of animals reflects the importance of obtaining nutrients, as some of the groupings are based on feeding styles. Nine major phyla of animals are considered over the course of three units. The Lower Invertebrates unit is devoted to those without true body cavities. A second biology study guide unit includes those invertebrates that have a true body cavity, while the third unit in this set is devoted to the phylum Chordata. The introduction to animals at the beginning of this unit covers the topics of symmetry and polymorphism, and introduces some different reproductive behaviors. Armed with these, the unit focuses in on the systems and survival strategies of these four phyla: Porifera (sponges), Cnidaria (jellyfish), Platyhelminthes (flatworms), and Nematodes (roundworms). 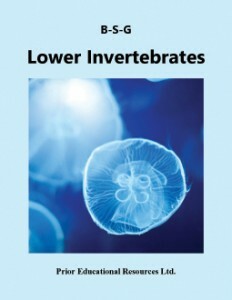 Lower Invertebrates is excerpted from our Biology 11 Study Guide, which is the fourth edition of a student study guide written to match the curriculum of British Columbia. The concepts presented are applicable to the biology curricula of other educational jurisdictions as well.